This is my five star review on Amazon. This is a short autobiographical book about the author who has a passion for riding. Her then husband buys her two horses and she acquires two others to look after. 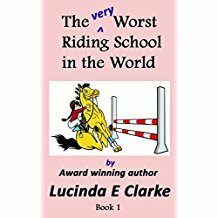 When one of her daughter’s friend’s mother offers to pay for a riding lesson, the idea for a riding school is born. This is the first book in a series and I can see it will appeal to children and young adults who are horse lovers.